I pulled into the car park at the mainland end of the Holy Island causeway, and Heather was already there for our Beginners Photography ‘Winter Wildfowl’ workshop. The first thing that struck me as I go out of the car was just how cold it was. With a bitingly cold cold wind racing across the exposed mudflats, it felt like the middle of the harshest winter. So, we started with a session in the car, checking camera settings and delving deep into the recesses of the camera menu. Then it was time to venture back out into the cold. Curlew, Redshank, Bar-tailed Godwit and Turnstone were eking out an existence in the wind-blasted landscape, a Little Egret still looked supremely elegant, with barely a feather ruffled out of place, and Heather’s attention was on a flock of Common Eider in the channel under the causeway. Our county bird is quite stunning, and makes a excellent photographic subject, so Heather was soon engrossed in capturing them whenever they turned their heads towards us and the slightly trickier task of catching one in the act of stretching and flapping it’s wings. 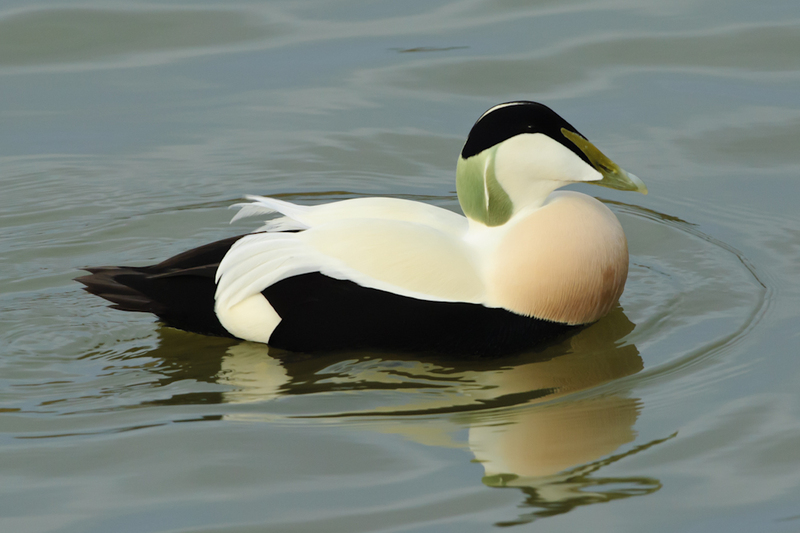 Here’s one of my images of a drake Eider, from a warmer and less windy session a few years ago, showing just how beautiful they are. Our Beginner’s Photography Workshops are ideal if you’re just getting used to your camera, or want to improve a particular skill or technique, so give us a call on 01670 827465 to reserve your place.